Pro Shot AS2 Rotary Slope Laser with R9 Detector. The Pro Shot™ AS2 construction Rotary laser is the class leader for delivering value in a precision slope laser. Dial-in up to a 25% slope, with resolution down to .01%. That is fine enough to set specified slopes straight from an engineer’s cut sheet on a sanitary sewer project. Pro Shot AS2 Rotary Slope Laser WITH DETECTOR. AS2 Precision construction slope rotating laser is a great value. The Pro Shot™ AS2 construction Rotary laser is the class leader for delivering value in a precision slope laser. Dial-in up to a 25% slope, with resolution down to .01%. That is fine enough to set specified slopes straight from an engineer’s cut sheet on a sanitary sewer project. This servo self leveling Rotary laser won’t let you down, with degrading accuracy as higher slopes are entered, like its competitors. It is also fully self leveling when slope is dialed-in. Specifications 2000’ dia., 1000’ rad. (610m/305m) ± 14 arc sec. (± .080" per 100') (± 2.0mm per 30m) 0 to 25% single axis, .01% increments Servo motor • ± 4 degrees Normally active, can be disabled 360º • 600rpm Yes, used with many brands of receivers 36 Month Guardian. Four C-cells • 115 hrs. nom. (alkaline) Optional Ni-Mh kit • 85 hrs. nom. Visible 670nm CDRH and IEC Class 2 To international standard IP56 -4º F to +140ºF(-20º C to +60º C) Range with R9 laser receiver. Accuracy .080 in 100 ft... Slope capability 0 to 25% in .01% increments. Self leveling type • Range 2000ft. Dia. Height alert if unit is disturbed. Rotation coverage • speed 360deg. 60rpm Machine control compatible ... Warranty 36 month guardian. Power source 4C- C-Cells 1500 hrs. • ..Rechargeable batts.optional 85 hrs. • Laser beam type AS2 Dust and water sealed . AS2 laser system including R9 receiver and carryingcase. Pro Shot TM construction Rotary laser systems are designed, built and tested at our factory in San Jose, California. For 20 years, our precision construction Rotary laser levels have been improving productivity and accuracy on sites around the world. 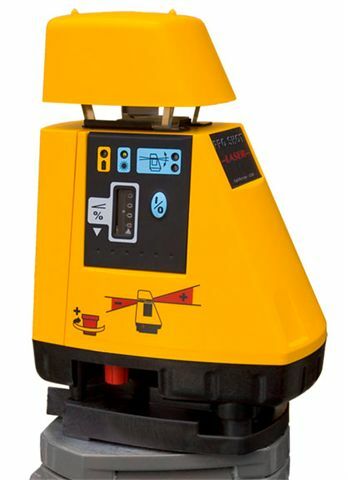 Our rotating lasers provide builders with level, sloped, coned, vertical and 90º layout references. Pro ShotTM self leveling construction lasers combine industry leading features, durability, accuracy and unmatched value. Take your best shot...with a Pro Shot! Since 1991, over 100,000 Pro Shot TM construction lasers sold. rotary laser system include R9 receiver, instruction book, and carrying case.